Jeremiah Graves ’12MS won a Daytime Emmy for ASTEROIDS!, an interactive short story starring two bumbling aliens. While the world of television is recognized at the 70th Emmy Awards tonight on NBC, one of those coveted shiny, gold trophies has already found its place in the home of Jeremiah Graves ’12MS. 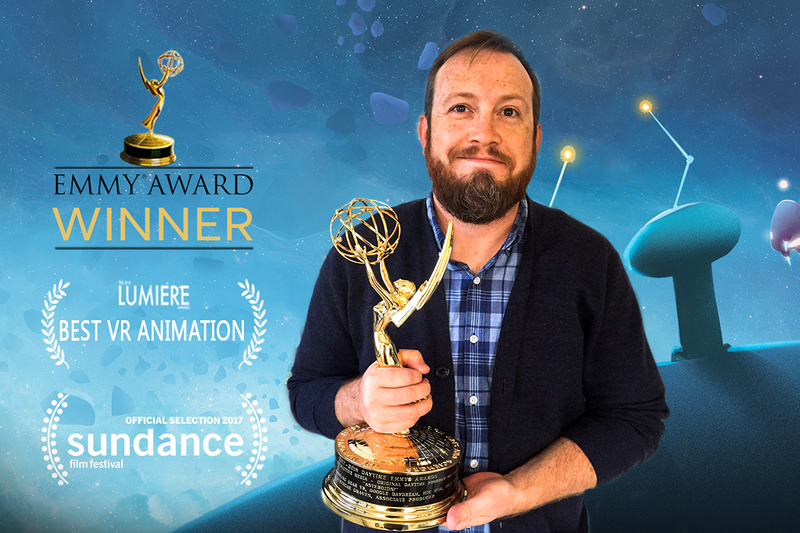 The interactive entertainment alum from UCF’s Florida Interactive Entertainment Academy won a Daytime Emmy earlier this year for ASTEROIDS!, an interactive, virtual reality, short story starring two bumbling aliens. Graves worked as an associate producer on the project and shares his experience of developing an engaging story in a VR world. Of course, I was thrilled! We’re actually two-for-two now. Our company, Baobab Studios, won the previous year, in the same category, for Invasion!. Coming off Baobab’s initial success on Invasion!, the team had a couple goals. First, to further explore the characters of the story’s bumbling aliens, who are called Mac and Cheez. Second, to give the user more of a role to play in the story. The pipeline we use is part feature film, part video game, and part just doing what we think will work because there are no turnkey development solutions for virtual reality interactive short-form narratives. How is telling a story in virtual reality different? Watch the immersive feature for yourself, and have fun exploring the 360-degree world. If you are in a web browser, click and drag with your mouse to look around the scene. If you are using your mobile device, watch the video in your YouTube app and tilt your phone in different directions to take a look around the spaceship. Besides the obvious experience and education I gained at FIEA, the program also got me my internship at Zynga. That’s where I met Maureen Fan, now Baobab’s CEO, who I worked for on FarmVille 2. My wife jokes that we don’t have a proper place for such a fancy award. Currently, it sits on an end table by our couch — next to [Amazon’s] Alexa and my PlayStation 4 controller. Most of the team was already heads down on the production of our next piece, Crow: The Legend (which launches to consumers this fall), by the time we won this Emmy. No rest for the start-up! NBC’s Saturday Night Live has 50 wins and 231 nominations. When do you think you’ll catch them?